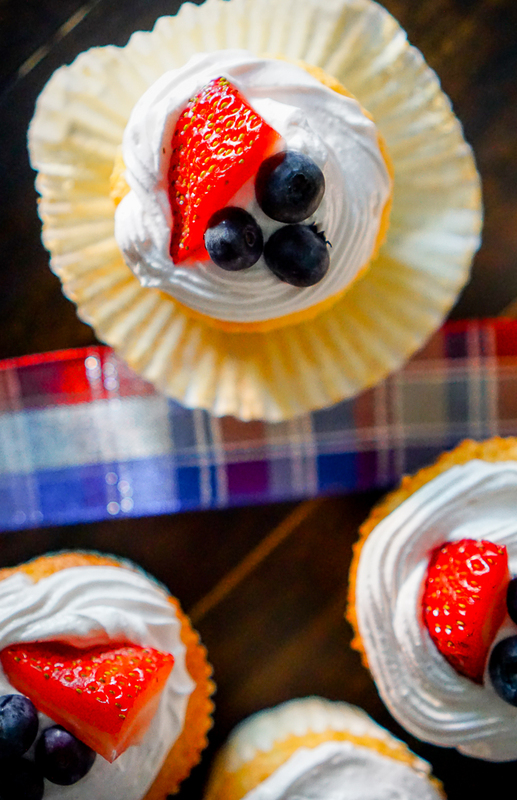 Make Individual Angel Food Cupcakes – a light summer dessert easy to serve at a BBQ or at 4th of July! Bryan and I had a grill out at a friend’s house last weekend! It was our first time seeing their new house and seeing them since their recent engagement. It seems like 2016 is a big year for our friends. There are babies, engagements, weddings, new homes – We are all doing some serious adulting! It is funny to sit around and think about how much the conversations have changed over the years when we get together, but also how they haven’t. It still wouldn’t be a friendly get together without talk of college, multiple Star Wars references (usually from Bryan), and video game reviews. Our hosts were nice enough to provide the main course so I got to baking dessert and a side dish I hope to share with you all next week! It was a warm day, so I wanted a dessert that light and airy while also being convenient for an outdoor BBQ. I don’t want to make our hosts work when serving the dessert. I had picked up some strawberries and blueberries at the grocery store, and they made me think Angel Food Cake, but I wanted an individual serving dessert recipe to bring. Then I thought Angel Food Cupcakes!! I had never tried making Angel Food Cupcakes before and was a little nervous about how they would turn out. Would the light sponge cake hold up to being held and bitten into. They did and they were amazing!! I don’t like icing – plus it would be too heavy for Angel Food Cake – so I used my Frozen Strawberry Yogurt Pie for inspiration and made a Strawberry Whipped Topping instead. It was perfect if I do say so myself … and my friends did, too! Then I just topped with a little bit of strawberry and a few blueberries! 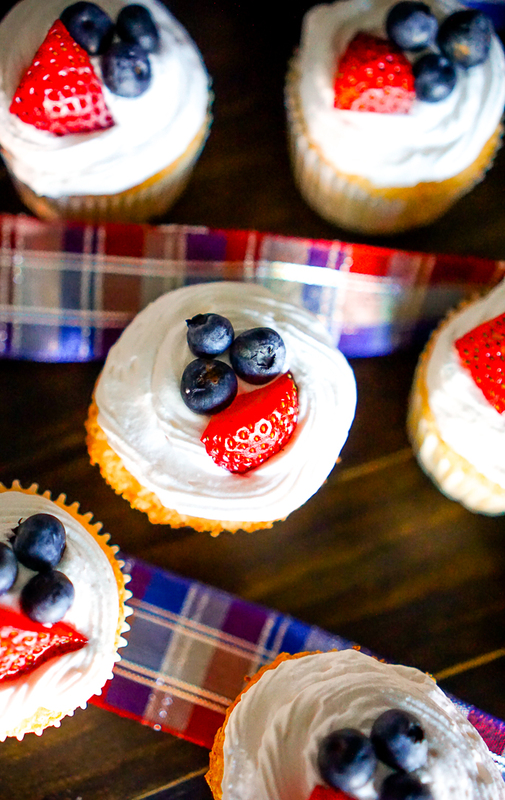 These individual Angel Food Cupcakes are perfect for summer and as a 4th of July dessert with a little Red, White and Blue (well, at least sort of white). Prepare Angel Food Cake as instructed and fill the cups 3/4 way full. 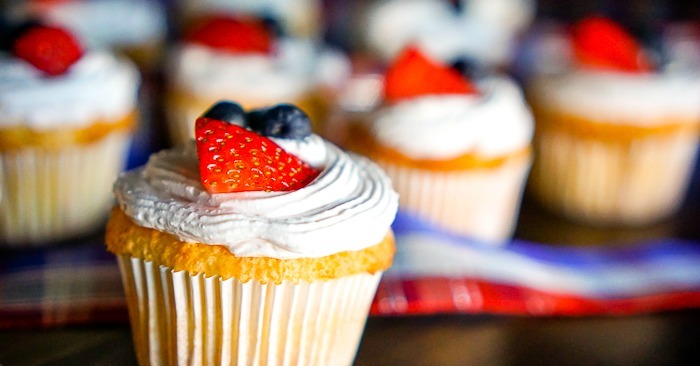 Bake at 375F for 12 to 18 minutes or until cupcakes are golden brown and tops feel dry. Let cool on a wire rack when done. 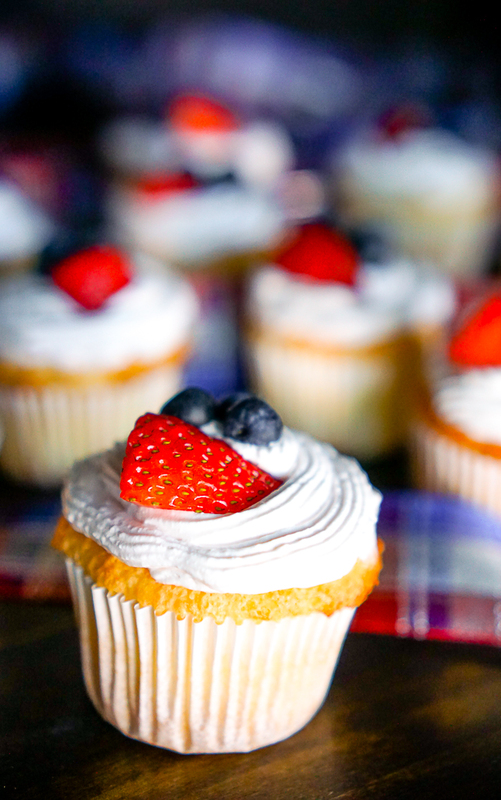 Combine Cool Whip and yogurt while cupcakes are baking and let set in fridge until ready to top cooled cupcakes. Add strawberries and blueberries and refrigerate until you are ready to enjoy!